Probably the product that we receive the most questions about from our customers these days has got to be our Golden Barrel Coconut Oil. Common questions are “How is it processed?” “Is it refined or virgin?” or “Can you substitute it for other cooking oils?” Hopefully, through this post we can answer these questions as well as provide some other interesting information about this increasingly popular oil. Only a few years ago, coconut oil was falsely considered to be very unhealthy due to its high saturated fat content. A supposed study was done claiming that use of coconut oil led to high cholesterol, heart disease, and obesity. 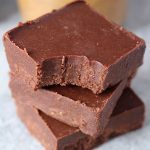 This study was based on a loose test done on hydrogenated coconut oil and greatly pushed by other cooking oil organizations to move away from saturated fats and in turn use their products. Unfortunately, this economic push and public belief discredited and virtually eliminated coconut oil as a cooking oil in America. Only recently, have studies revealed that, trans fat created during hydrogenation is actually the main culprit causing heart disease and high cholesterol. Contrary to previous belief, not all saturated fats are unhealthy. In fact, most of the 90% saturated fat in coconut oil is medium-chain fatty acids which are found to be easily digested and quickly converted into energy. Almost 50% of the fatty acid content of coconut oil is lauric acid which is a great enhancer for the body’s immune system. In comparison, lauric acid is a main component of human breast milk which essentially protects children during infancy from illness. Another 7% of the fatty acids are capric acid which stimulates anti-viral activity in the body. Coconut fat is also believed to stimulate the metabolism and slow weight gain. An interesting article by Ray Peat can be found here which lists some examples of coconut oil being used by farmers in the 1940’s to try and fatten their animals. The result was the opposite effect as the animals became “lean, active and hungry.” For more information and a detailed look at the health benefits and anti-saturated fat agenda, please visit www.coconutoil.com. Our coconut oil is considered refined (RBD) and not virgin. The most noticeable difference between the two is that refined coconut oil is bland to the taste and smell whereas virgin coconut oil has a distinct coconut taste and odor. The refined coconut oil is processed by pressing the dried coconut meat (copra). It is then purified with adsorbent clay, heat, and vacuums. After this, the oil is run through filters to remove any clay. It is then deodorized with a process of steam distillation, high heat, and vacuums. Next, it is filtered again before going into the final storage tank. After deodorization, a small amount of citric acid is added as a processing aid to the coconut oil for degumming purposes. Citric acid is considered worldwide to be a harmless food additive that is naturally found in citrus fruits. Finally, the oil is filtered two more times before being packaged. There are no solvents used or hydrogenation which produces trans fats. Virgin coconut oil adds a distinct coconut odor when using and taste to food that isn’t always desirable and can even be revolting. Some people experience nausea and diarrhea from consuming virgin and don’t with refined. Virgin coconut oil is usually far more expensive than refined. Refined has exactly the same medium-chain fatty acids as virgin. Refined offers a higher smoke point of 450°F where virgin is only 350°F making it ideal for frying. Using refined or virgin is a matter of preference, but either way coconut oil is a great option for many purposes. In addition to its stable shelf life, it works great as a cooking/frying oil and can be equally substituted for any other cooking oil. Coconut oil can be used in baked goods as a substitute for other oils, butter or shortening. It also performs wonderfully as a moisturizer and is very beneficial in soap making. Numerous soap makers use our Golden Barrel Coconut Oil when making their own soaps including Heritage Soaps who said on our Facebook page, “This Coconut Oil is the best — I use it in all my soaps!” Check out their website, www.heritagesoapspa.com, for a wide variety of handmade soaps made on a local Lancaster County Farm. So if you haven’t tried coconut oil yet, why not make the switch. Your health and taste buds will thank you for it. Here is another post about using coconut oil to treat psoriasis and Here is one for making Homemade Coconut Oil Toothpaste. For Candida sufferers, the citric acid in this coconut oil is an undesirable component, as commercial-grade citric acid is essentially a mold byproduct, which feeds Candida. I'm pretty disappointed. I bought this product after reading that the only ingredient on the label was coconut oil, then I read this article how it has citric acid in in. You may want to add that to your labels! We understand your concern. The purpose of citric acid during the coconut oil processing is as a degumming agent. It is added for its technical effect during processing but present in the finished oil at insignificant levels with no functional effect. Such processing aids are exempt from declaration in ingredient statements primarily because of its nonfunctionality in the finished coconut oil. Hopefully this will help clear things up. I did too….I am beyond pissed !!!! Sorry that you are upset. However, regular coconut oil can be used exactly the same way as Extra Virgin Coconut Oil just without the taste or smell. Virgin Coconut Oil will always say "Virgin" or "Extra Virgin" on the label. We do offer Golden Barrel Extra Virgin Coconut Oil also. The label clearly says "refined." How could you think is was virgin coconut oil? You have no reason to be upset with the company. I agree with Sara it is completely ridiculous to be upset with the company just because you do not know how to read labels. I still think you should add citric acid on the ingredient label as my son is allergic to it. I'm glad I read this information and someone mentioned that before I gave him anything with the coconut oil in it. I will not be buying your product in the future. So disappointed! Here is some other info on the process – Refining, Bleaching & Deodorizing: The crude oil is first repeatedly filtered to obtain a clean filtrate. The oil is also bleached in the process as this filtration is done using calcareous clays. Then, it is heated at very high temperature. This serves dual purpose. It deodorizes the oil and also kills the germs or fungal spores in it. Thereafter, sodium hydroxide (Na (OH) 2) is added to it and further filtered to remove the mono-fats or free fats. Finally, in some cases, it is hydrogenated to ensure that no unsaturated fatty acids are left in it and its shelf life is elongated. ◦ Difference from Pure Coconut Oil: Refined Coconut Oil differs from pure coconut oil in many respects. First, you won’t find any scent (typical coconut scent) or taste of coconut in it, unlike in pure coconut oil. This deodorization is deliberately done since although many may like the scent of coconut in their cooking oil, there are many who don’t. Being refined, it is certainly more hygienic than the crude coconut oil, but not that beneficial from the point of view of health. It is left with almost no proteins or minerals. Its shelf life is longer than that of crude or pure coconut oil. Hi, I don't see a link to your online store anywhere? Hi Andy, our online store can be found at http://www.goldenbarrel.com. I have a friend with a strong nut allergy. She is afraid to try coconut oil. Is this fear grounded? Generally, a coconut differs from a tree nut in that it is actually a member of the palm family and is said to not cross react with tree nuts. It is possible to be allergic to coconut itself but it is also possible to be allergic to tree nuts and peanuts and not coconuts. A few years ago the FDA lumped coconuts and other nuts together as tree nuts for labeling purposes which did cause some confusion. In the case of coconut oil, the oil mentioned in this blog post is made from the Cocos Nucifera plant and is considered highly refined. This means that it has gone through several stages to remove impurites which would include the proteins that could cause allergic reactions. However, if your friend has a legitimate concern about a reaction, I would recommend consulting a doctor before trying coconut oil just to be safe. Does this article mean to say that Golden Barrel's refined coconut oil is expeller-pressed? That's the term I'm used to reading. Also, where are your coconuts sourced? The product isn't certified organic, but depending on your sourcing, maybe that's not even a concern. Thanks for your time. Hi Laura, Yes pressing and expeller pressing would be the same thing for this oil. The other form of pressing would be cold pressing which is only used for oils that have a delicate flavor or odor such as our Extra Virgin Coconut Oil. All of the coconuts used to make our coconut originate from the Philippines. Should the oil be refrigerated?I like to use it at room temp. 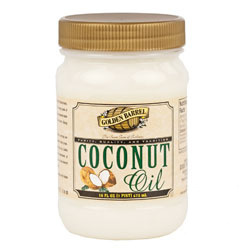 Hi, coconut oil is fairly stable and can be stored in a regular pantry or cupboard. It does not require refrigeration. Depending on the temperature where it is stored, it may switch back and forth between a solid and a liquid but will not affect the quality of the coconut oil. Our regular coconut oil is not certified organic. Therefore there are not necessarily any restrictions on sprays. According to the supplier, the coconuts are grown using traditional methods and are non-GMO. @Betsy J – In all reality coconuts grow so high in the air that they are beyond the reach of most pests – and spray guns for that matter. Of the few studies undertaken none have found any pesticide residue in either the flesh or water of the coconut. To be honest you'd have more problems with Poly-aromatic hydrocarbons (carcinogens) produced during quick drying. Fortunately these are not present in refined or wet-milled unrefined coconut oils. Is your refined coconut oil refined using a natural, chemical-free cleaning process since you mentioned it is steamed or do you use some chemicals/solvents such as lye? Is the refined oil made from the rancid oil byproducts leftover from creating dessicated coconut flakes? Thanks! -Sarah P.
According to the supplier, no chemicals/solvents are used. It is made by pressing the coconut meat specifically for oil use and not the byproduct of something else. Do you use hexane in the refining process? Hi, according to the supplier, no hexane is used. The refining of the coconut oil is done by pressing. Does your refining clay contain lye? How long is its shelf life? I just bought three 5 gallon buckets and didn't realize that the shelf life might not be that long. Please let me know. My email: lovescole@gmail.com. This is wonderful! We stopped by a kind-hearted and very nice family's general store while picking up our produce one morning and found this product on the shelves. I was so grateful, as my mother doesn't like the taste of coconut oil (but we love it) and this is processed in a way that is in line with what we feel is important. Thank you for providing it! There are a lot of corporations that sell cast-off refined coconut oil that has to be treated with hexane and myriad other chemicals; I'm thankful this is not one of those brands. 🙂 Hoping all the best for your continued success. To save money, I cook with refined oil and use the ogragic virgin coconute oil on my face. (much more expensive) Are the health benefits the same in coconut oils whether refined or not? There is much info out there and often confusing! I just bought 2 large bottles of your oil. I'm pleased with it for cooking! (and soaks in quickly as a handcream too!) Please reply…. The health benefits in refined versus extra virgin are very similar in that they have the exact same fatty acid content. There is some debate that some of the nutrients may be removed during processing of refined but it is still considered one of the most healthful cooking oils. The main thing to lookout for would be whether the refined coconut oil is hydrogenated or not which creates trans fats. All of our coconut oil is non-hydrogenated. LOVE Your Product !!! Use it for cooking and in many foods along with adding it to my dogs food to help their skin and coat. Glad I found You ! Can I use this coconut oil as a face and body moisturizer? I also wondered the same thing. I bought some today. so its safe to eat as well as use for a moisterizer? Yes it can safely be used for both. We have many customers that frequently use it for both applications with great results. I want to use the coconut oil for baking, thinking mostly of pie crust. Do I use like shortening or follow oil pastry directions? 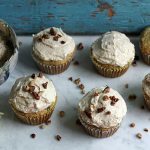 I use coconut oil for baking and everything always turns out great! I just purchased a jar of coconut manna labeled as organic whole coconut, also a product of the Philippines. It states on the label that 1 Tbsp (14g) has only 8g of saturated fat. This seems to be consistent along other organic and virgin coconut oils. How does your refined coconut oil contain 13g of saturated fat in a 1 Tbsp (14g) serving? Also, I gather from recent posts that you do not do the refining process in your factory, however it is done elsewhere, so how do you know whether chemicals are added or not added? Does heating the product to high temperatures during the refining process destroy any of the medium chain fatty acids? I understand that the proteins will be destroyed during that process. Thank you for replying in advance. 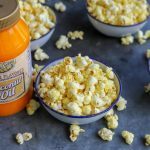 To answer your questions, the Coconut Manna that you are referring to is actually different than coconut oil and is more of a coconut butter. It is made a little differently and that is why you are seeing a difference in saturated fats. Our label nutritional statement of 13g per tbsp is actually quite consistent with most other coconut oil labels on the market. You are correct in that the refining process is not done at our facility. It is in fact partially done in the Philippines and further in the United States at a different facility. Part of our approval process is gathering statements assuring how the oil is processed from suppliers. Part of the nature of refined coconut oil is that it undergoes high heats which unfortunately does eliminate some things that virgin coconut oil contains. 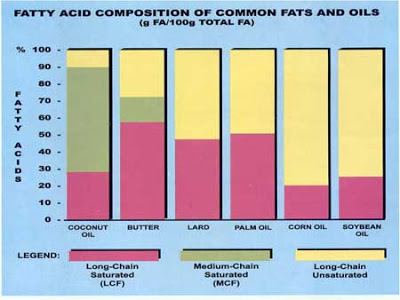 However, the fatty chain acid content should still be virtually the same in refined vs. virgin. You are correct, the Manna is different, and the virgin coconut oils have the same fatty acid content as your refined product. My mistake. I dont see in your online store your virgin coconut oil. Where would I find that product. Unfortunately, we are not currently offering a virgin coconut oil only refined. We have in the past but it was discontinued for various reasons. Great, we are glad that you are putting our coconut oil to such beneficial use. Thanks for sharing. I was wondering what the shelf life on the coconut oil is? I'm looking to buy in bulk and would like to know how long I have to use it up. Coconut Oil is quite stable. The shelf life we give to a pail is generally about a year. However, if kept stored in a cool, dark place with the lid on, it can last much longer. I am aware of a customer that had a pail that they tapped into for up to 4 years and it lasted fine. The only thing that could really happen to it is start to turn rancid over time if exposed to extreme conditions which you would be able to tell with an off odor or taste. Can this be beneficial for hair?? It does work well in soap making or as a moisturizer, so it may very well work for hair. However, we do not have any information to back that up. Perhaps a simple Google search would provide some information. Thanks for the comment and for using our coconut oil. You made the right choice in making the switch. I've been purchasing this product for about a year now and was glad to find your website and explanations of the process and ingredients. I was surprised to read about the citric acid added as it is not on the label. Please tell me the source of this citric acid. One relative has a lemon allergy and I need to know if your product contains lemons in any form. Thank you. Hi, the supplier says that the citric acid is from microbiological fermentation of carbohydrates (mostly from corn). The source is not lemons. Hope this helps. Do you guys use formaldehyde to de-husk your coconuts? Are your coconuts certified organic? If not, what standards have not been met to have them certified organic? Hi, we just verified from the coconut oil source that no formaldehyde is used in the de-husking. It is done manually. Also, the coconuts are not certified organic. They are GMO-free and no chemicals are used in the extraction/refining process but have not necessarily gone through the organic process and paper trail from growth to finished product that a certification company would require in order to label it as organic. For any psoriasis sufferers out there, this product is amazing. Just use a tiny bit, which is all that's needed. If you are in an area below 76 degrees, the solid just melts right into the skin. Within a day I noticed a huge improvement. HUGE. I was just going to comment, and read yours! Yes, yes YES!! I have been fighting psoriasis for years, and several years back now I was diagnosed with Psoriatic Arthritis. I'm taking this as part of my nutrition regimen, and also applying to my plaque psoriasis. I made the mistake of using too much, but it was a minor mistake as I just rubbed it in further up my arms and down to my wrists, and on my shins and ankles as well as my knees and elbows where I meant to apply it. It liquifies nearly instantly at skin temperature, so work with a little TEENY bit, as you can always add more! I am applying twice a day, my knees are nearly CLEAR, and my elbows are vastly improved! I also am going to apply to my scalp on nights when I'm going to shampoo in the morning… Bonus – I love this for all my cooking needs! Just made up a batch of frosting, cut the butter by 2/3, and it's wonderful! LOVE IT!! Thanks for sharing. We may use both of your comments in a future post about psoriasis and coconut oil if you don't mind. Anonymous July 27th 2014, If you had read some of the answers that Golden Barrel had given about the citric acid you would see that it is not citrus, but a "microbiological fermintation of Carohydrates"(basically made from corn), as far as the dog, she probably just likes the taste of coconut, has nothing to do with the quality, I have three dogs one that likes the taste and two that donot, but they all like the refined, I guess if your that concerned about citric acid, and your dog's taster. Buy the more expensive Virgin oil but please don't give a company that sells a very good produst a bad rap just because you didn't take the time to invetigate further, and because you dog doesn't eat a food that has no taste and no smell. I would like to see a " how to use for cooking and skin care " for your Coconut Oil. Thanks for the suggestion. We plan to do more detailed posts on how to use coconut oil in the near future which would include recipes. Check back or follow us on Facebook or Pinterest to see when they are posted. I like to know is this product is safe to take it everyday as a healthy thing. I read that coconut oil is good to prevent Alzheimer if you take a teaspoon everyday. According to much research, coconut oil is one of the most healthful oils and is indeed safe to use. It is loaded with Medium Chain Fatty Acids that the body can easily convert to energy. It also has lauric acid which aides the immune system. As far as whether it can help prevent Alzheimer's, I will defer to the video in the above article. Great stuff. I use it in homemade dog food for my rescue dogs that come in with special skin conditions. Love it. It has been a miracle ingredients in there food. I purchase the refined coconut oil at a local Amish store, and I love it. I am wondering what the highest temperature is that the oil is heated to during processing. If the smoke point is roughly 450, does the heat during processing damage or break down the oil in any way? Thank you! 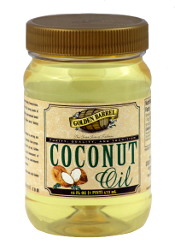 Hi, our coconut oil is heated up to 435 degrees F during the deodorization process. It does not affect the oil as far as fatty acid composition. It is thought that as compared to virgin coconut oil, some of the polyphenols that are naturally occurring in coconuts may be somewhat broken down during the process. However, refined coconut oil still has all the lauric acid and other medium chain acids in it and is still considered one of the most healthful cooking oils. Sounds great, thank you so much for your reply!! I was so happy to see this product at a local Amish market. We didn't buy though, because I wanted to find out if it had the coconut odor. I was so glad to find out that it does NOT! We used the unrefined in stir fry and it totally ruined the recipe so we buy the refined. Much MUCH better – plus it still has the same health benefits. Also, it's inexpensive. At Walmart, the leading brand they sell is $5.98 for 30 ozs. Yours is $3.69 for 32 ozs. Sounds like a great deal. Coconut oil is expensive wherever we've looked! We're considering ordering the 5 gallon bucket!. Hi Kathy, Glad that you found us. 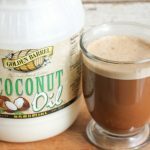 I put coconut oil in my coffee everyday and it has helped me in losing weight, but I use organic virgin oil, which is pricey. I came across your product at an Amish store and the price was great, but I noticed that it was refined. The only thing I can gather from this thread and other pages I researched is the smell of coconut is gone, which is no big deal to me. So is it safe to say that if I make the switch to refined, I can still get the same benefits as non refined oil, without the big dent in my wallet? I would hate to put all the hard work I have been putting in to losing weight in jeopardy. Hi and thanks for the question. You are correct in that refined coconut oil is exactly the same fat content as virgin coconut oil with all the lauric and other medium chain fatty acids. The experiment that many people refer to back in the 1940s was where a farmer used coconut oil in attempt to fatten up his livestock. The unexpected result was that the cattle became lean and healthy. The oil in that experiment was referred to as a “cheap coconut oil” and was most likely refined. Virgin coconut oil has obviously undergone less processing so the belief is that it may contain some phylonutrients that are not necessarily in refined coconut oil. However, the myth going around the internet that virgin coconut oil is good for you and refined is not is simply not true. There is no reason to believe that refined coconut oil would have a negative effect on weight loss or anything else. Whether virgin or refined, coconut oil is still considered one of the most healthful oils. If you do decide to use it, we would love to hear more about your experience with it. This is an excellent deal, I really hope you will ship the 5 gallon to Canada. I usually pay close to 200.00 for the unrefined 5 gallon bucket…can't afford it anymore. Hi, The shipping charges may be quite expensive to ship to Canada through our website. I would recommend calling us at 1-800-327-4406 to possibly get a better rate. For cooking or baking, you can substitute coconut oil evenly for butter or any other cooking oil. For health purposes, I have heard of people taking a tablespoon a day or more to reap the health benefits. You can take it straight or mix it in coffee or any other food or drink. I would recommend starting small if you are not used to eating that kind of fats as it can take a little adjustment for the body. I usually use Nutivia Coconut oil for soap making. Its usually $35 to$40 for 50 oz. This was 96oz for $9.99 so I gave it a try. Do not use this for soap making! My soap is a sticky blob. I used the exact same recipe as I always do. I am pretty disappointed. I was not planning on using it for hair products or to cook with….the only good thing is it was only $9.99 and I can trash it. Hi Tracey, I am sorry that you had a bad experience with our coconut oil. That is odd that it caused your soap to become a “sticky blob.” Coconut oil in itself isn’t sticky and shouldn’t add that sort of consistency to soaps. I really don’t know what would have caused that. I can tell you that we sell a lot of coconut oil to various soap makers all around the country who use it very effectively for personal and business use and frequently tell us how well it performs. I hope that you will consider giving it another try. Hi, Thanks for your response. I suspected it might of been the Lye so I returned it and brought more. I had the same result. Its a lot softer then it usually is with virgin coconut oil. I always use the same recipe so I know exactly what it should look like in 24 hours and 6 weeks. Maybe it will be fine and equivalent to my usual batches after the full cure of 6 weeks. I will let you know. No one seems to know if refined coconut oil takes longer to harden then virgin. Yes, please let us know how it turns out for you after the full cure. Maybe another soapmaker will see this and add a response as to how it compares to virgin while hardening. I appreciate GoldenLabel’s honesty in disclosing the refining process of their RBD coconut oil. “Tropical Traditions” and “Wilderness Family Naturals” doesn’t mention about Citric Acid in their RBD Coconut Oils. Is that why they are expensive? or Are they intentionally hiding the information? I don’t know if it is really possible to refine coconut oil without Citric Acid. Not much info on web. Thanks, we really wanted to be open and honest about the process. I really can’t say for sure how those other brands refine their coconut oil, but they are not required to disclose it as it is a processing aid. There is a pretty good chance that they use citric acid as well. Hi Linda, It is perfectly safe to give to puppies. We have numerous other customers that use use for their dogs as well with great success. It is a safe food product and there should not really be any side effects. Obviously, it is an oil and if you do give too much at once, it can take a bit of an adjustment for the stomach to get used to it. As far as what dosage to give a puppy, I really have no insight into that. But I am sure there is something on Google somewhere.